Last month I introduced you to some of the embroidery features on THE Dream Machine 2 by Brother. 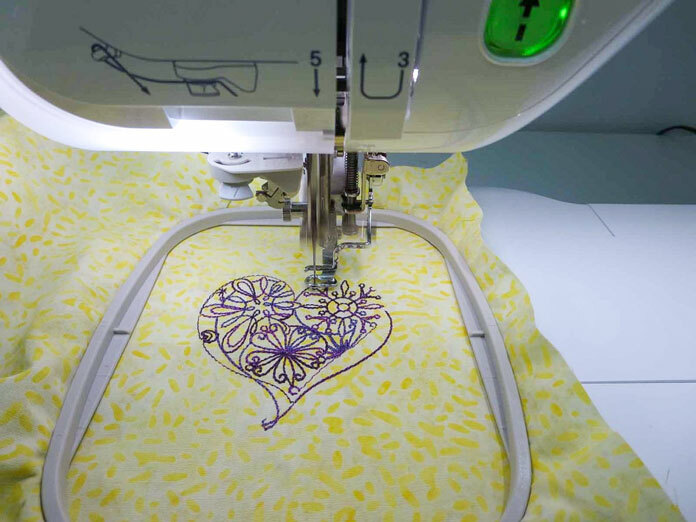 Be sure to look at my blog posts for September 25 – 29, 2017 to see some of the basic embroidery features of this machine. Join me this week, as we explore more quilting ideas to make with this outstanding sewing/embroidery machine. Even though Halloween might soon be over by the time you’re reading this post, this idea is something that’s easily adapted to any holiday season. I wanted to make a small wall quilt or table runner with some of my leftover “Pumpkins for Sale” fabric from Northcott and incorporate some machine embroidery as well. Rather than use a built-in embroidery design, I decided to look for some other sources. There are lots of machine embroidery web sites which sell designs, but I wanted to try something different. I looked online for “Halloween coloring pages” and found lots of free designs that could be downloaded. Remember to be aware of copyright restrictions (if any) on any designs that you download. 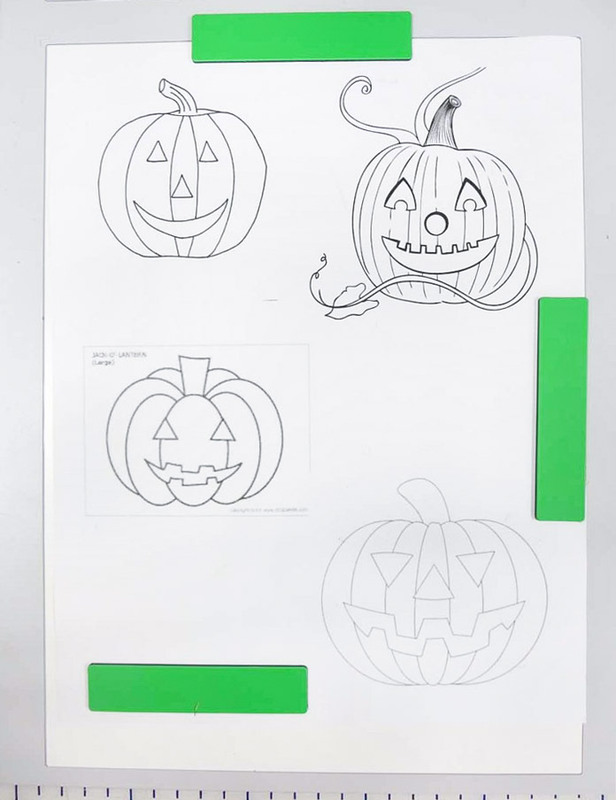 I chose 4 jack-o’-lantern designs with simple design lines and printed them on white paper. You can see that one of the designs on the paper has light, rather indistinct lines. These lines would not show up well when used with the scanner of THE Dream Machine, so I decided not to use that one. I placed the paper on the scanning frame, scanned each design into the machine and saved each one as a separate file. Read more about using the scanning frame on THE Dream Machine 2 in my blog post on September 29, 2017. Now I could re-size the designs to any size I liked using the arrow buttons on the screen. I made each design about 3″ square. Then I colored the design lines with a triple-stitch using the line fill tool. 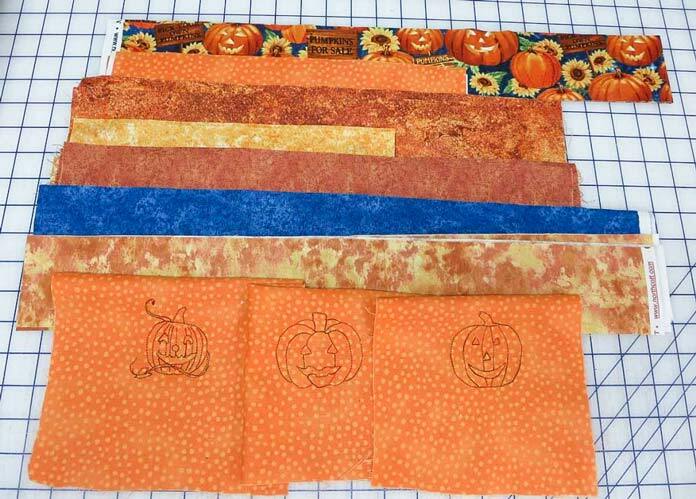 The designs are now ready to be stitched with a 30 weight rayon variegated orange thread. 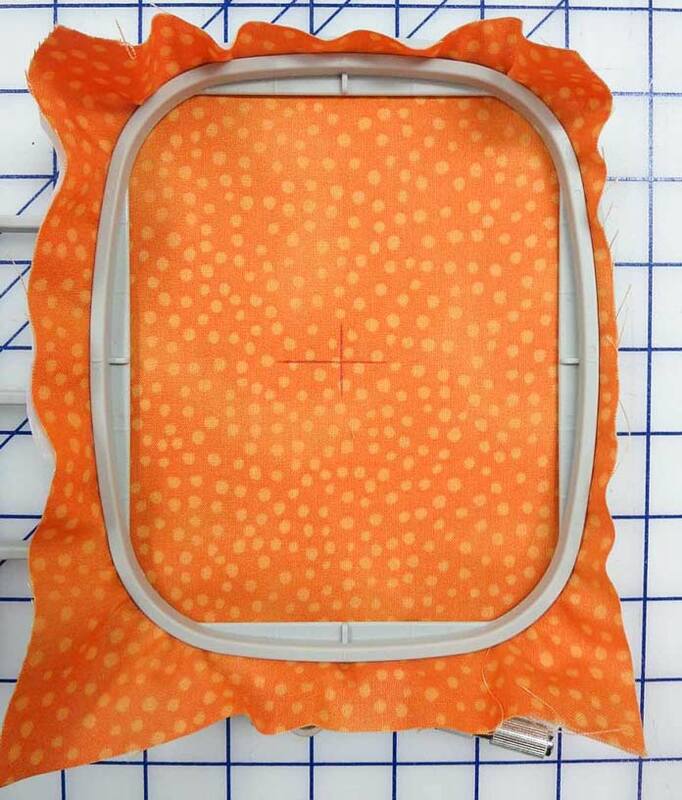 I placed a light-weight, tear-away stabilizer on the back of the orange fabric before putting it in the embroidery hoop. Along with a very detailed manual, THE Dream Machine 2 comes with a large LCD screen, which among other things, has a wonderful help screen. Just touch the button with the ? mark on it, either with your finger or the stylus that comes with the machine and you have access to dozens of help screens. 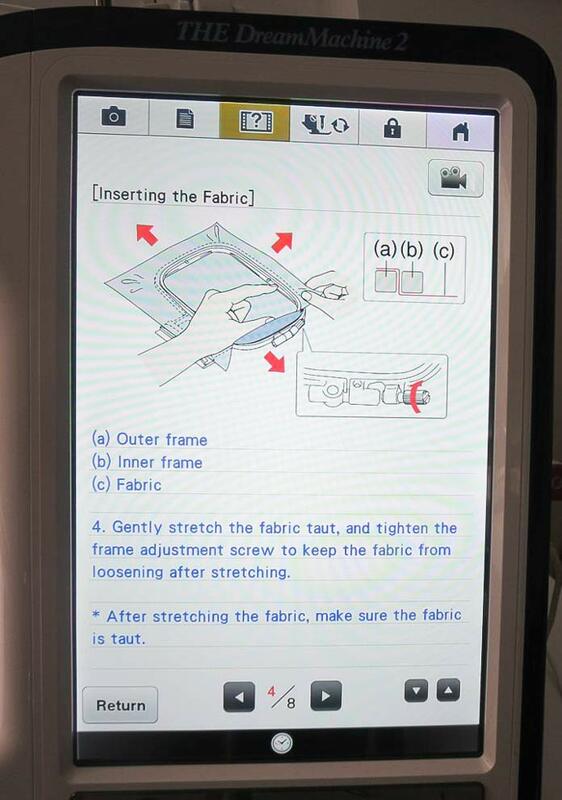 Here’s one of the help screens that shows how to hoop the fabric. 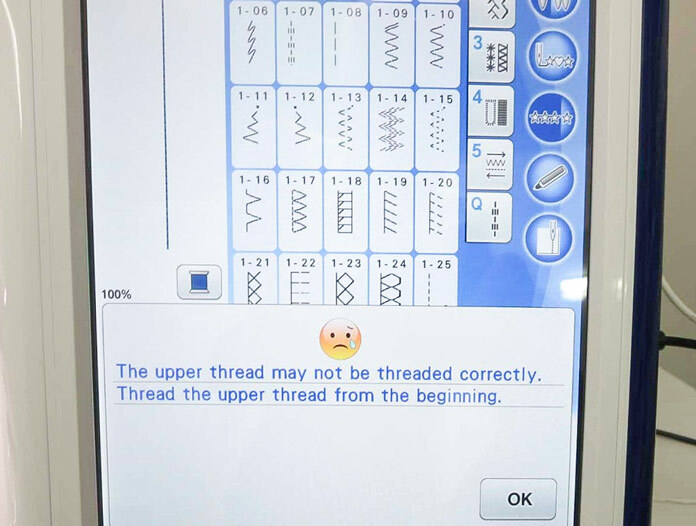 Sometimes when embroidering, the machine will stop and you get this little sad face with a message which usually means the thread has broken. Not to worry! Just follow the on-screen instructions and re-thread the machine. Then press the “needle back buttons” to get back to where you stopped stitching, and you’re ready to embroider again. You can also press the “camera” button (Yes, THE Dream Machine 2 has a camera that shows exactly where you were stitching!) if you want to line up your starting position even more precisely. This is another good reason to stay at your machine when embroidering and not go off to make lunch, put in a load of laundry etc. You don’t want to come back and find the machine has stopped and no stitching has been done! Here are my little pumpkin designs all stitched out. 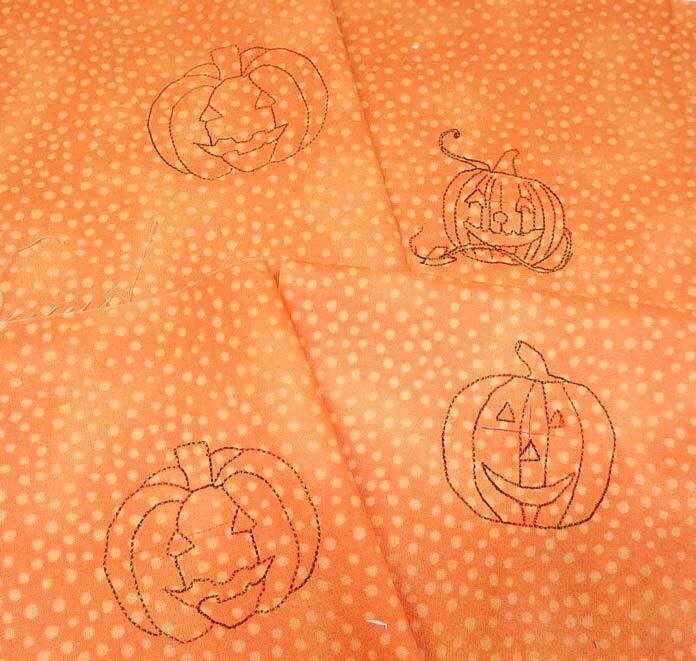 Be sure to come back tomorrow, and I’ll show you how I used THE Dream Machine 2 by Brother to make a Halloween wall hanging with the machine embroidered pumpkins and this collection of Halloween fabrics. How PFAFF’s creative 3.0 built-in stitches make a gift bag irresistible!